Climate Assessment »The National Climate Assessment offers a wealth of actionable science about the causes, effects, risks and possible responses to human-caused climate change. 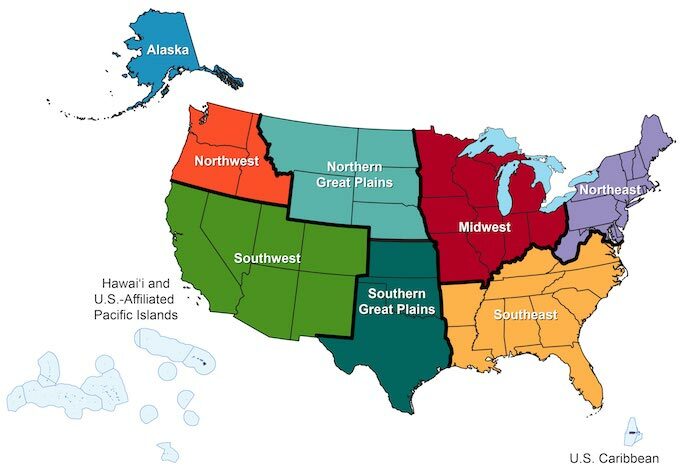 NOAA, the NCAnet Education Affinity Group, and members of the CLEAN Network have developed a series of guides for educators that focus on the regional chapters of the Assessment Report, helping to unpack the key messages of each region and point to related, high-quality online resources. Report Findings: The National Climate Assessment summarizes the impacts of climate change on the United States, now and in the future. The 4th National Climate Assessment (NCA4) had two parts: Part I was an update on the scientific findings from the 2014 National Climate Assessment and was finalized in 2017. Part II, released in 2018, focused on the impacts, risks, and how the US is adapting to climate change. Read more about the findings of these reports. Part I (2017). The Executive Summary lays out the main findings, with a focus on temperature increases, CO2 level increases, and that it is extremely likely that human activities have caused these rises. It also describes documented changes in surface, atmospheric, and oceanic temperatures; melting glaciers; diminishing snow cover; shrinking sea ice; rising sea levels; ocean acidification; and increasing atmospheric water vapor. The global, long-term, and unambiguous warming trend has continued during recent years. Since the last National Climate Assessment was published, 2014 became the warmest year on record globally; 2015 surpassed 2014 by a wide margin; and 2016 surpassed 2015. Sixteen of the warmest years on record for the globe occurred in the last 17 years (1998 was the exception). Annual average temperature over the contiguous United States has increased by 1.8°F (1.0°C) for the period 1901–2016 and is projected to continue to rise. Heavy precipitation events in most parts of the United States have increased in both intensity and frequency since 1901. There are important regional differences in trends, with the largest increases occurring in the northeastern United States. Extreme temperatures in the contiguous United States are projected to increase even more than average temperatures. Future decreases in surface soil moisture from human activities over most of the United States are likely as the climate warms under the higher scenarios. The world's oceans have absorbed about 93% of the excess heat caused by greenhouse gas warming since the mid-20th century, making them warmer and altering global and regional climate feedbacks. Global mean sea level (GMSL) has risen by about 7–8 inches (about 16–21 cm) since 1900, with about 3 of those inches (about 7 cm) occurring since 1993. The world's oceans are currently absorbing more than a quarter of the CO2 emitted to the atmosphere annually from human activities, making them more acidic, with potential detrimental impacts to marine ecosystems. Since the early 1980s, annual average arctic sea ice has decreased in extent between 3.5% and 4.1% per decade, has become thinner by between 4.3 and 7.5 feet, and is melting at least 15 more days each year. September sea ice extent has decreased between 10.7% and 15.9% per decade. The observed increase in global carbon emissions over the past 15–20 years has been consistent with higher scenarios (e.g., RCP8.5). In 2014 and 2015, emission growth rates slowed as economic growth became less carbon-intensive. Even if this slowing trend continues, however, it is not yet at a rate that would limit the increase in the global average temperature to well below 3.6°F (2°C) above preindustrial levels. Unanticipated and difficult or impossible-to-manage changes in the climate system are possible throughout the next century as critical thresholds are crossed and/or multiple climate-related extreme events occur simultaneously. Part II (2018). The Summary Findings included below represent a high-level synthesis of the material in the underlying report. The findings consolidate Key Messages and supporting evidence from 16 national-level topic chapters, 10 regional chapters, and 2 chapters that focus on societal response strategies (<a>mitigation</a>and adaptation). Summary Finding 1: Communities. Climate change creates new risks and exacerbates existing vulnerabilities in communities across the United States, presenting growing challenges to human health and safety, quality of life, and the rate of economic growth. Learn More. Summary Finding 2: Economy. Without substantial and sustained global mitigation and regional adaptation efforts, climate change is expected to cause growing losses to American infrastructure and property and impede the rate of economic growth over this century. Learn More. Summary Finding 3: Interconnected Impacts. Climate change affects the natural, built, and social systems we rely on individually and through their connections to one another. These interconnected systems are increasingly vulnerable to cascading impacts that are often difficult to predict, threatening essential services within and beyond the Nation's borders Learn More. Summary Finding 4: Actions to Reduce Risks. Communities, governments, and businesses are working to reduce risks from and costs associated with climate change by taking action to lower greenhouse gas emissions and implement adaptation strategies. While mitigation and adaptation efforts have expanded substantially in the last four years, they do not yet approach the scale considered necessary to avoid substantial damages to the economy, environment, and human health over the coming decades.Learn More. Summary Finding 5: Water. The quality and quantity of water available for use by people and ecosystems across the country are being affected by climate change, increasing risks and costs to agriculture, energy production, industry, recreation, and the environment. Learn More. Summary Finding 6: Health. Impacts from climate change on extreme weather and climate-related events, air quality, and the transmission of disease through insects and pests, food, and water increasingly threaten the health and well-being of the American people, particularly populations that are already vulnerable. Learn More. Summary Finding 7: Indigenous Peoples. Climate change increasingly threatens Indigenous communities' livelihoods, economies, health, and cultural identities by disrupting interconnected social, physical, and ecological systems. Learn More. Summary Finding 8: Ecosystems and Services. Ecosystems and the benefits they provide to society are being altered by climate change, and these impacts are projected to continue. Without substantial and sustained reductions in global greenhouse gas emissions, transformative impacts on some ecosystems will occur; some coral reef and sea ice ecosystems are already experiencing such transformational changes. Learn More . Summary Finding 9: Agriculture. Rising temperatures, extreme heat, drought, wildfire on rangelands, and heavy downpours are expected to increasingly disrupt agricultural productivity in the United States. Expected increases in challenges to livestock health, declines in crop yields and quality, and changes in extreme events in the United States and abroad threaten rural livelihoods, sustainable food security, and price stability. Learn More . Summary Finding 10: Infrastructure. Our Nation's aging and deteriorating infrastructure is further stressed by increases in heavy precipitation events, coastal flooding, heat, wildfires, and other extreme events, as well as changes to average precipitation and temperature. Without adaptation, climate change will continue to degrade infrastructure performance over the rest of the century, with the potential for cascading impacts that threaten our economy, national security, essential services, and health and well-being.Learn More. Summary Finding 11: Oceans and Coasts. Coastal communities and the ecosystems that support them are increasingly threatened by the impacts of climate change. Without significant reductions in global greenhouse gas emissions and regional adaptation measures, many coastal regions will be transformed by the latter part of this century, with impacts affecting other regions and sectors. Even in a future with lower greenhouse gas emissions, many communities are expected to suffer financial impacts as chronic high-tide flooding leads to higher costs and lower property values. Learn More . Summary Finding 12: Tourism and Recreation. Outdoor recreation, tourist economies, and quality of life are reliant on benefits provided by our natural environment that will be degraded by the impacts of climate change in many ways. Learn More . *Please note NOAA is still updating their NCA resource pages, so many of these still refer to NCA3. However, they are still useful resources for educators.